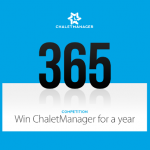 Just a quick post to let you all know that those nice people over at Chalet Manager are offering a free year’s subscription to their service for one lucky owner. Chalet Manager offers a service for ski property owners that helps you manage your chalet or ski resort. Bookings, guests, transfers, finance all taken care of. Allowing you more time to spend on the slopes.